Adventure on the ancient main trade routes of the Middle East. Some years back, I saddled a camel for the adventure of a lifetime. A relatively thin slice of land along the Mediterranean Sea has been called, “The Sacred Bridge,” by scholars. In the place where nations have rubbed shoulders with one another for thousands of years, the changes have been only in the surface of the highways: narrow dirt paths gave way to Roman paving stones, later to asphalt, then to super-highways. A region with thousands of years of history make the mind reel for those of us birthed in a nation that is a mere 238-years old. The vast desert to the east of the bridge kept international trade routes in a narrow corridor near the Mediterranean Sea. The Via Maris, “the Way of the Sea”, (in aqua) runs parallel to the Mediterranean Sea near the coast. The Kings Highway (in red) runs along the crest of the mountains of Moab and Ammon on the east of the Jordan River and Dead Sea (known as the “Salt Sea” in biblical times). The Spice Route (purple) ran from the Arabian Peninsula through Petra, intersecting both the King’s Highway and the Via Maris, then on to the sea at the southern-most port at Gaza. By no accident, the Sacred Bridge was the site of God’s greatest advertising campaign. The choice was dictated by location — the place where the nations continually passed by. In the midst of cultures given to the worship of many gods, God’s people living in Jerusalem stood as a beacon of truth: the worship of One God, the only God. The book of Acts, chapter two, reads like a United Nations gathering on the day in which God’s fire was poured out. The nations mentioned ring the Sacred Bridge like the spokes of a wheel. No one present would return home silent about what they witnessed that day. In the next week over 8,000 locals and visitors came into the Kingdom of God and were publicly baptized. This bridge plays no less a role in the future than it has in the past in spite of modernization and progress. Isaiah 19 spells out it’s importance explicitly. ‘Egypt My people, Assyria My handiwork, and Israel My inheritance are blessed'” (Isaiah 19:23, 24, HCSB). I am not alone in wanting to visit, see, smell, taste and experience the cradle of history. It is alive with the glory of our God, recorded in the Love Letter He left us. Millions come annually, in spite of danger and turmoil, to breathe in the most historically-famous place in the world. It’s a place where the “Greats” passed through: from Alexander the Great to Napoleon Bonaparte. However, they were mere visitors on a web of ancient highways taking goods and people from Africa to Europe and Asia. A network of byways connect the major highways and have remained as ancient as they were thousands of years ago. It’s to this place that my wild heart is drawn. I love the adventure and the extreme heat, scorpions and dangers of that famed dusty path known as the “Spice Route”. Carol and I have recently traveled the King’s Highway through Jordan: from the Red Sea Port, to Saudi border and all the way up to the Syria border in the north. 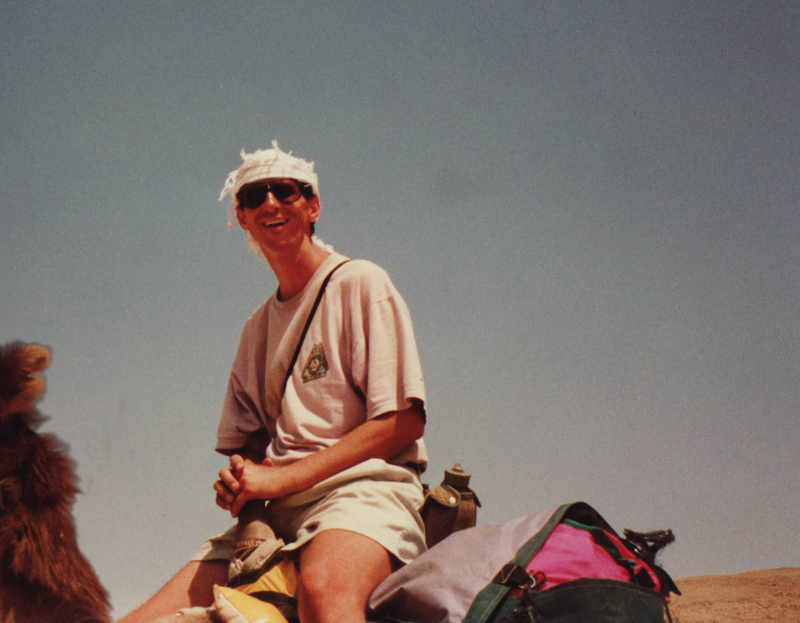 Many years ago, before fully understanding Isaiah 19, I led a group of adventure-seekers on a three-day camel trek on the Spice Route in the Aravah on the Israeli side. This route runs perpendicular to the King’s Highway and the Via Maris, and crosses both of those famous routes. Seffy, our seasoned desert guide. A most important ingredient: a sense of fun. The photos above show Seffy, our camel-trek guide, as he gives important instructions about the dangers of the desert before we leave the safety of the encampment base on the crest of the mountains above the great African Rift. Lots of sunscreen, water, hats, and most of all, loads of fun. Never forget the fun! Then, it’s off across the desert we go. Velvety hills, carved into terraces by the tiny feet of hundreds of thousand of sheep and goats over the centuries, create a photographer’s paradise. A normal hike, or desert journey, is magical in and of itself, but, to know you are on the same route trodden by great men for several thousand years is overwhelming. We take off across the wadi. Each two people are assigned a camel. One will walk, the other rides, trading off every few hours. There are ups and downs for our ships of the desert. We cross wadis (dry river beds) and climb mountains on the ancient dusty paths. Our guide points out an almost perfectly round flat stone. We learn that this is an ancient directional road sign that has been used for thousands of years. Upon closer inspection we see ancient writing scraped onto the surface of the stone. Well-acquainted with the desert, our guide, Seffy, knows where to find hidden agricultural tools in cracks and crevices along the way. This winnowing fork and the ancient road sign deepen our sense of awe of where we are. Deciding on the camp site. No fancy catering, just ancient methods of cooking. The nuts and bolts of the trek were setting up camp late in the afternoon, baking bread like the Bedouins on a large metal wok turned upside down over the fire pit, eating with the hands group style, and of course resting in the heat of the day under a shade anchored by four camels at each corner. Then instructions for bedding down at night: “Check your sleeping bag area for scorpions!” Very important. The yellow ones are small but very poisonous. Sure enough, one of our ladies slept on top of one. Thankfully, no harm done; the scorpion stayed put all night long. Our guide tells us of the camel caravans, numbering as many as two thousand manned by only 20 men, bringing salt from Ethiopia. The worth of such a caravan could reach as much as $12-million dollars in today’s currency. A tribe of Nabatean desert dwellers controlled the Spice Route as it wound its way through what is now south-central Jordan. These desert dwellers knew the secrets of the arid wilderness–where to find water and food supplies. The Nabateans made their living by taxing the traveling caravans who had to pass through their territory. The infamous salt mines of Ethiopia. Camel Caravans: Like scenes from a movie, yet still the same today. The Ethiopian desert is a harvest of salt to be transported by camel caravan. Only a few men were needed to tend large numbers of camels. Along our route were ancient Khans (simple Inns for lodging and food for caravaners). Some ancient structures remain partially intact. The antiquities authority has provided information stations along the way to make the journey more meaningful. Few tours to Israel have time for these journeys. The map shows two spice routes from Jordan through Israel to the Mediterranean port. Nubian goats: whom you might see along the way. The big boys: massive gazelle buck, guardian of the desert mountains. Previous structures punctuate the landscape on the Spice Route. Our route towered above the canyons. Staying high on the mountain crest was the only way to keep cool as valley floor temperatures could reach 115-degrees fahrenheit. In all this history and beauty, one thing has struck Carol and I repeatedly and that is the history of the spread of Christianity in this Sacred Bridge. Our journey through Jordan was conspicuously punctuated with that fact through the ancient Christian church mosaics unearthed by archaeologists from the north to the south. Though Jordan is an Islamic country each hotel we stayed in proudly displayed large mosaics on their lobby walls. Each of these mosaics was from an ancient church. The heritage of the area is clear: Christ reigns there. Our mandate is to declare Him Lord of the region and call forth this ancient heritage and inheritance once again until the Light of the world is once again blazing bright. Jerusalem in the sixth century AD. In the Cardo, in the Jewish Quarter of Jerusalem, there is also a mosaic uncovered in Madaba, Jordan, near Mount Nebo. It is a mosaic map of ancient Israel focusing mostly on Jerusalem and the Nea Church there in 540 AD. Sixth century Jerusalem is depicted in the center of this mosaic map. The red lettering in the white area at top reads, “Hagia Polici Yerusalem” — “The Church of the City of Jerusalem,” The main street of Roman times, the Cardo, is central in the mosaic: the colonaded shopping mall that bisected the city. The story of the Sacred Bridge is not finished. What seems to the thousands of tourists that visit, a historical era of the past, has yet to see its crowning splendor. Israel’s own, Ben Gurion declared that the future of the region would be brought to fullness when technology brought life and agriculture to those deserts. There are those who know, and can appreciate, what God has proclaimed about the region. Not just the bridge itself, but the surrounding neighboring nations and peoples being pulled into the vortex of His glory: Egypt, Jordan, Israel, Assyria (Syria, Lebanon, Nineveh, and Iraq. Though the boundary lines of the region have changed multiple times through the centuries, the dawn of God’s intentions for His people remains firmly intact. He sends us as forerunners to make the path straight and prepare the way. Pray for the peoples of the region as God draws all men to the light of His glory. The prophet sat in a daze with that thousand-mile stare of one seeing beyond the shadowlands of the physical world. Isaiah’s scribe knew the look, and immediately took up pen and scroll ready for what was coming. He was a trained scribe—God’s secretary—recorder of the timeless world of a holy throne room. His countenance turned toward the south in the direction of Mitzraim (Egypt)—Israel’s southern neighbor—who had at times been a friend, at other times a foe. The words were tumbling forth now, painting the vision for the hand armed with pen and scroll. The great and mighty nation’s woes spilled out of the prophet’s mouth like a waterfall. Isaiah spoke like a thunderstorm in another voice, a perfect voice filled with authority and majesty colored by Heaven. The scribe shuddered. It seemed that the prophet controlled the atmosphere in the room like a mighty storm so that the everyday objects of the palace faded into a shroud of the dark prophecy. The very God of Heaven rode down on Isaiah’s words to touch Earth in His fire. “Kings . . .” and “war . . .” spilled out; “brother against brother”; “terrors…” and “devastation…” darkened the room. Depression swirled in the circle with Isaiah’s flowing robe. There was no time for emotional paralysis—the words were coming in a rush. The hand hurried to keep up; the swift scrawling letters imprinted matched the urgency of the prophet’s message. “Sun . . . sun . . . the sun . . . Heliopolis will speak Hebrew,” the prophet whispered. The city, named for the sun god of the Egyptians, would speak Hebrew? The scribe shifted in his seat, sitting more uprightly . . . more was pouring forth from Isaiah’s mouth. Isaiah hurried out of the palace toward the stables. He didn’t speak a word as if on pause between segments of a download from Heaven. He merely gestured to the stable boy—two horses. Yuval managed to quickly gather up his inkpot and scroll but hoped the prophet’s words would not flow on horseback. He would have to try to remember them. From the palace they traveled west and moved to the ridge road that connected Jerusalem with Bethlehem. Turning south they rode in silence; Isaiah’s face set like a flint. Determined, yet not harsh, was the prophet’s appearance. In the distance the hill rose where the southern military armory was located at Talpiot. A smaller path led up the hill eastward to the armory. Isaiah guided his horse east and upward. Upon arrival, they skirted the armory to the east and turned the corner to the south side and a long promontory that seemed to end in space, high above the deep valley that separated Jerusalem from Bethlehem. “The King’s Highway.” He stroked his beard, “Oh God! My God!” the words escaped his lips on a soft breath, not pleading, rather in wonder. He lifted a hand as if tracing the route of the King’s Highway that traversed the far ridge of mountains on the other side of the River Jordan. “That’s the highway . . . Right there it is,” turning slowly southward his hand changed history tracing the highway toward the border of Egypt. “There . . . there . . . Yuval, do you see it? There will be a memorial pillar to the LORD, and beyond, in Heliopolis, an altar. He will rescue them from themselves. Ancient King’s Highway, Jerash Jordan. The prophet bent again as if giving birth. He groaned deeply. He sank to his knees both hands extended upward. Yuval could hardly write . . . What could the prophet be saying? What? Had he lost his mind? Isaiah ceased speaking. It was a good thing . . . Yuval sat stunned. In his years with the prophet, he had never known him to be wrong, but this . . . Yuval could not speak. He merely stared with Isaiah at the eastern horizon where the highway lay—that famed ancient trade route connecting so many nations of the world. This, the prophet had uttered, is where hundreds of thousands of feet had previously tread a world-renowned trail would one day be a highway of holiness unto the Lord of Hosts. Enemies would embrace one another in the fear of the Lord. A tear fell from Yuval’s cheek. In stunned silence Isaiah rose, gathered himself together, and mounted his horse, awaiting his scribe to do the same. The sun was sinking in the west and the color embraced them in golden hues as they made their way back to the city of the Great King—where history was fashioned by the hands of a servant of the Almighty, the Most High and Holy God. IS A MAJOR WAR LOOMING IN THE MIDDLE EAST AGAIN?